This month's selection is the continuation and completion of Peter Rabbit. This month's reading selection is Peter Rabbit. Join us for a special story time party complete with a Peter Rabbit story, egg hunt and craft! We'll be celebrating spring with this timeless character. Join us and introduce your children to Peter Rabbit and the stories by Beatrix Potter. This event is $5 per child. Pre-registration is required. Spaces are limited to 30 children. Tickets can be purchased in the store. Please call 215-256-9311 if you have questions or to purchase over the phone. Beatrix Potter was born in south Kensington, London, to a wealthy family. She was educated by a governess and had a sheltered childhood with her younger brother Bertram. They kept an assortment of pets, including rabbits, mice, frogs, lizards, snakes, snails, and bats. She began to draw and paint at an early age, and her parents encouraged her interest in art, providing her with special tutors and taking her to exhibitions at galleries. The family spent summers in Scotland and later in the English Lake District, which provided much inspiration for her later work. She made her debut as a writer with a small animal book called A Happy Pair (1890), published under the pseudonym H.B.P. Her most famous work, The Tale of Peter Rabbit, was privately printed in 1901 in an edition of 250 copies, and then published by Frederick Warne & Co. Her wildly popular series of children's books, with their charming watercolor illustrations, also launched entire industries of pottery, tea-towels, plush toys, and animated films. With her royalties, she bought Hill Top, a 17th-century farm at Sawrey, Lancashire, in the Lake District, which became the setting for several of her books. At age 47, she married William Heelis, a solicitor, and gradually stopped writing. She bought a sheep farm and spent her last 30 years raising Herdwick sheep. Beatrix Potter is currently considered a "single author." If one or more works are by a distinct, homonymous authors, go ahead and split the author. 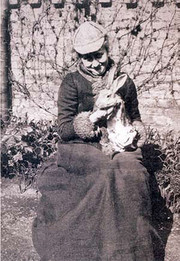 Beatrix Potter is composed of 22 names. You can examine and separate out names.